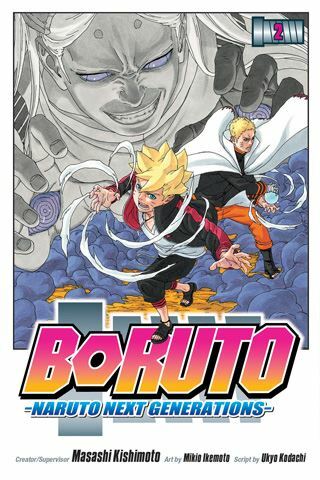 VIZ Media Gains "Boruto: Naruto Next Generations"
VIZ Media and Eleven Arts Debut "Boruto: Naruto the Movie"
Uzumaki Naruto was a young shinobi (ninja) who lived in the shinobi Village of Konohagakure. He had an incorrigible knack for mischief and was the biggest troublemaker at the Ninja Academy. However, Naruto was serious about his quest to become the world’s greatest ninja and the Hokage, leader of his village. But this is not Naruto's story. This is the story of Naruto's son, Boruto! Naruto is the Seventh Hokage; his face is even on the Hokage monument. Boruto would really like to topple that face. Boruto: Naruto Next Generations, Vol. 2 (entitled Stupid Old Man!! – Chapters 4 to 7) opens in the middle of the Chunin Exams for young shinobi. Boruto is winning his matches, but he is cheating by using prohibited ninja tools from the Scientific Ninja Tool Corps. What will happen when the truth is revealed? Redemption may come when members of the Ohtsutsuki clan attack. THE LOWDOWN: As a huge Naruto fan, I am glad to be back in the world of my favorite Shonen Jump title, Naruto. I have been waiting for the Boruto: Naruto Next Generations manga, and while it is not the manga that Naruto was, Boruto is off to a good start. I have been a bit cool to Boruto; obviously, I did not like him the way I did his father, Naruto. However, Boruto: Naruto Next Generations Volume 2 really shows the potential of Boruto as a character on the journey of the hero's arc. In many ways, Boruto is like Naruto, except the son does not possess the supernatural attributes that his father did as a boy. Naruto creator Masashi Kishimoto supervises this series, but the creative team is artist Mikio Ikemoto and script writer Ukyo Kodachi. This duo hits all the familiar Naruto notes, but they are using that to tell a different story. This is the world of Naruto from a different perspective, and if other creative teams can do what Ikemoto and Kodachi are doing, the world of Naruto can remain open through so many other characters. Right now, Boruto is rising. Vol. 2 is the best volume yet. I READS YOU RECOMMENDS: Fans of Naruto will want the Shonen Jump title, Boruto: Naruto Next Generations.